Robert completed his Juris Doctorate at the University of Windsor. At Windsor he participated in numerous activities including Community Legal Aid where he served as a caseworker. During law school Robert completed an externship at the Library of Parliament in Ottawa. Robert articled and worked as a summer student at Kelly Greenway Bruce before being called to the bar in June of 2014. Robert was born and raised in Oshawa. He attended Dr. S.J. Phillips P.S. and R. S. McLaughlin CVI. 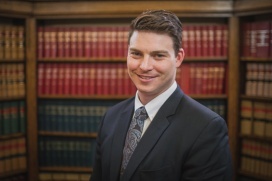 Prior to law school, Robert attended Wilfrid Laurier University where he received an Honours Bachelor of Business Administration with a concentration in finance. Robert has strong Oshawa roots having played in many competitive sports such as hockey and soccer. He still enjoys participating in all sports, particularly hockey and golf.